G-Nade - Anyone seen the ads for this in Airsoft International? 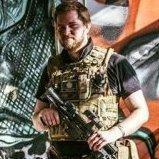 Been seeing this in AI for about 4 months now and it's the same every time, no more info given, emailing the address gets no reply (according to someone on airsoft forums in Ireland) and the info given in the advert really don't give much to go on. Anyone know anything about them? Seen them for sale? Have one? Seen one? Used one? Etc. well, I get 404 on g-nade.com it would not be the first time someone started a bfg project just to realise they could not complete it. I was very tempted as well at one point, glad I didn't. First time I see this.. Don't think I'd get this, cartridges are probably exclusive, I wouldn't be comfy throwing around something with a chip in it, it looks like a toy (well, which it is), and it's bad enough having to worry about not losing the pin (which, after all, you can make yourself) when throwing a bfg, nevermind having to keep a spoon aswell.. I can't see how it could possibly compete with smoke bombs as we know and love 'em. All that volume of particulates has to start as solid fuel, eh? 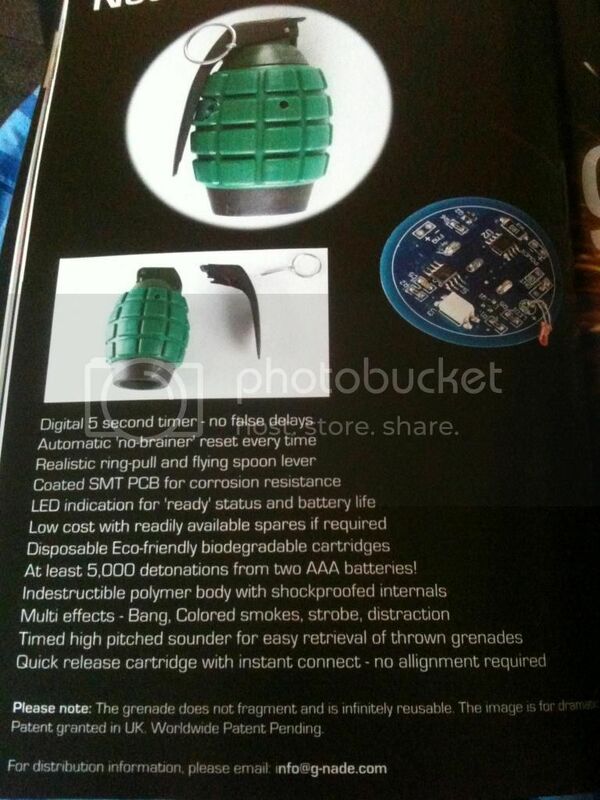 They couldn't possibly fit enough in this grenade, along with the batteries, circuit board and mechanism, to create much of a cloud. This claim makes me think it's not a finished product. I've been asking around my contacts on Facebook and I have it on good authority that they're actually pretty good fun and work well. I also have it on good authority that they're about the size of a large mug... Which I think is stupidly massive. I thought it'd be about the size of a clenched fist. I also have it that they'll be appearing around January time, up to now they've only been trialled by a select few people, one of whom, is my good authority. Also, a note on the smoke, (although I didn't ask,) I thought that the smoke would just be for effect to add to the bang, more than to use as an actual smoke grenade. Although, since I imagine just about everyone was expecting it to be a lot smaller than a large mug, there probably actually is enough space on the inside for a relatively large amount of solid fuel. Lastly, I was right in my initial assumption that it's just an electronic trigger for a one use only bang cartridge. It then beeps loudly after detonating so it can be found and picked back up. I'd be interested to see if you could trick it into thinking it'd properly detonated something, and then just use the collection beep tone to count as the kill sound, giving you a 100% battery powered "pyro" which I think would be great. Especially if they're tough enough to have passed the trial phase. How much did your BFG cost in the 1st place? *shurgs* cant remember, around 80 I think.